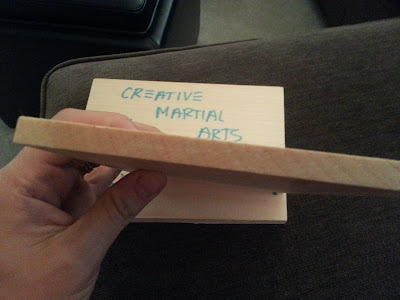 For the last couple months, our 8 year old has been attending a Creative Martial Arts after school intro program. He's brought home numerous insights about jabs, crosses, and both snap and roundhouse kick. He's definitely enjoyed it quite a bit. This last weekend, though, was the big test. 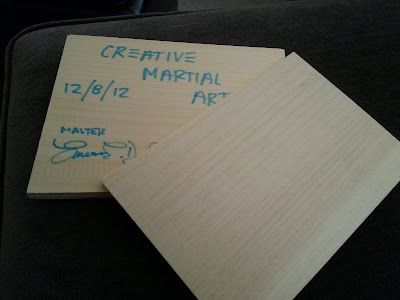 If the students performed well enough, they'd earn their White Belts and get a chance to break a board. Well, as you can imagine, the class rose to the occasion and put on quite a martial-arts show. Indeed, they all earned the right to crack a board in half using nothing but their fist. I've got to admit, I was surprised at the challenge in front of these kids. It's scary enough to think that you're going to be punching a solid slab of wood, it's another to do it in front of 40+ onlooking parents. And how'd our kid do? Well, check it out! That there is the real deal: a board broken in half by a single cross punch. While we were proud of our little Ninja, I was just as impressed with the studio that put on the class. They talk about how martial arts can be used to teach confidence, disciple and fitness - and we saw all that on display. That, and a lot of patience and positive reinforcement. If you're in Arlington, and looking for a fun after school activity or camp, you should check them out. It is never too late, but sticking with martial arts from a young age is awesome. Great life skills, especially from taekwando (my experience at least).